This site provided by the Minnesota Department of Natural Resources features extensions developed to help users be more productive with ArcView. The Garmin GPS Extension was built to help users directly transfer data between Garmin GPS handheld receivers and various GIS software packages. 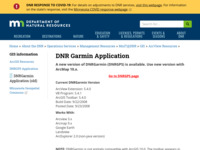 The free download includes, but is not limited to, the following functionalities: real-time tracking, image hotlinking, USB connectivity, download waypoints, tracks, and routes from Garmin GPS and save as ArcView shapefiles or graphics, upload waypoints, tracks, and routes to Garmin GPS, and calculate shape attributes and circular error probability.